We have dealt with the word retarded before here. It is a slang that I think is quite misunderstood and misused. I don't know whether it is the tough economic times or something else but I seem to be observing more and more attitudes about people who experience disabilities. I don't think I have ever heard the word "retarded" more. Getting angry, while probably justified, is not working. We try to educate whenever possible. Here is an example of an incident that Billy Ray and I experienced recently. A mother and two teenagers were within maybe a foot of Billy Ray when she uttered the R word. I do not think she was specificially referring to Billy Ray but he certainly picked up on the word. I took him by the hand and walked up to them. First I asked permission of the mother to talk to her daughter. Then I introduced Billy Ray to her. I asked her if she knew what the word retarded actually meant and she said no. I explained that it only meant slow and that while Billy Ray and I are both slow in certain areas it is probable that his strength in some area exceeded her strength in that area. She was truly embarrassed, apologizing a lot. I told her I didn't want that but I wanted her to stop and think so it stops at her generation not being passed down for future generations. She seemed more likely to remember the situation and alter her behavior than if there had been an angry blow up. By helping the community to know our kids as they are instead of sterotypes,hopefully, we create deeper understanding and acceptance. Advocacy must educate to achieve desirable results. It is taken me years to see that instead of blowing up. I have been haunted lately by the reality of what we don’t know that might make a real difference in the lives of our children and adult children. As most of my regular readers know, Billy Ray has chronic pancreatitis, which comes with severe pain and other issues such as pancreatic insufficiency, which has similarities to diabetes. When he was originally diagnosed, I was told that it was caused by Depakote, which he had taken for a number of years for his bipolar. Early last summer he was referred to the chronic pain management clinic at OHSU. There I learned that they see many patients with Down syndrome and pancreatitis. During research for my first book I spoke to several doctors and medical schools about how much training medical providers are actually given regarding children and adults with special needs. The phrase “touched on lightly” seemed to come up in many conversations as an example of how little actual training in special needs was provided to medical students. According to the National Association for the Dually Diagnosed (an association for people with both developmental disabilities and mental illness diagnoses), a survey of doctors in the state of Illinois found that, out of 312 respondents (a 24 percent response rate), 95 percent acknowledged that they treat patients with developmental disabilities and 70 percent acknowledged that they had no formal training in the area. In Billy Ray’s case the enlarged pancreas, which may have been the beginning of the pancreatitis was not found easily. He had been sick for a couple of months and nothing definite enough to be causing his rapid deterioration could be found. I have written about that experience here. 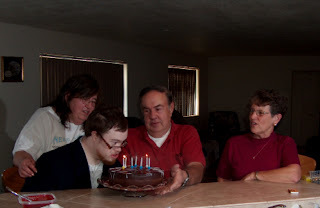 As shared in the post linked above, when I took Billy Ray to the emergency room in July 2005 the emergency room doctor wanted to send him home on increased pysch meds. The cause of his severe pain was only dealt with after I advocated strongly (read that blew up) and further testing was done. The more we know about his medical needs the more we are able to deal with his behavior issues. It has certainly made a difference in his life. I can’t help but wonder with doctors not being given enough information about things that might be common in certain disabilities and parents having no way of knowing, how many behavior problems are being treated with pysch meds (which don't really work anyway) when they are really medical issues. I have been trying to follow the publicist assistant’s advice to combine the blogs for both of my books into one blog. However, I have been having great difficulty figuring out how to get the feeds to various places switched. For example, Wellsphere feeds one blog to their Autism community and the other to the Down syndrome community and they can’t feed the combined blog to both communities. I thought I had it fixed for Amazon Kindle readers but apparently not. For now I am going to post on the two blogs and post both of them on the combined blog as well. Hopefully, I will get things switched at some point be down to one blog. I have been posting stories of abuse and literal torture on my other blog here and here. While this post goes along with the idea of protecting children and adults from that kind of abuse I decided to put it on this blog where more parents of young children would see it. I believe the best protection for children and adults from abuse is to have relationships with people who will stay involved and aware of what is going on in the life of your adult child. As stated in those posts some have said they do not have time to establish those relationships. It does take time but adds immeasurable value. Billy Ray’s best friends, Donna and Max, are an important part of his life. I know that if something happened to me they would be calling him, visiting him, and checking on him just as they do now. The relationship he has with them is not just for his benefit. I know that he touches their lives too. In fact while they are on vacations, etc. they send him cards that say how much better their lives are because he is in it and gifts that have so much thought in them that I know he is always on their minds. Donna makes the high fiber cookies that Billy Ray needs for regularity. They are the same recipe that I make (off the oatmeal box) but he will eat them better if Donna makes them. These pictures of Billy Ray blowing out the candles on their birthday cakes show the affection they have for him. They are always on his mind too. He has a picture of Donna and himself on the refrigerator. He looks at it several times a day and talks about her each time (see picture below). Recently I was having a conversation with another friend about Billy Ray’s relationship with Donna and Max. She commented that Donna and Max see Billy Ray as a person not just a “special kid” as others might. This is the kind of relationship you want for your child. It seemed important for Billy Ray to be understood for who he is so as I do things with him and for him in their presence I would explain why he needs things a certain way. As they began to know him better, Donna felt comfortable asking questions that helped her to understand him even better. This relationship impacts Billy Ray and provides a sort of protection; however, it also contributes a lot to community acceptance. People are always telling me that Donna talks about Billy Ray constantly. Billy Ray, as seen through his friend’s eyes, is even more accepted as a person. Others are willing to take the time to get to know him because of the stories she tells of fun things he has said or done. While there is not time to form a lot of relationships for your child is good to have more than one. Donna and Max are closer to my age than to Billy Ray’s age. I know that they will always be there for him if they can but someone closer to his age would be a great back up. We stopped on to meet Tonka on the way to a Mother's Day weekend trip. I couldn't wait to share some pictures with all of you. The sun was bright and it made it hard for Larry to see the pictures he was shooting. He shot over 50 shots. There were smiles and expressions that he couldn't catch with even that many tries. Billy Ray was elated. More to come when Tonka gets old enough to come home to Billy Ray.